Out of a sea of Black and White plastic, the E7 emerges as a stand out from the crowd with its stylish anodised aluminium cover, tough, durable and available in varying colours from Silver white to Dark Blue. This is definitely a phone aimed at the business market, with a massive 4″ AMOLED screen that utilises Nokias ClearBlack technology, improving outdoor visibility and producing rich and intense colours with incredible contrasts ratios. Unlike the N8, the 8MP camera sits flush with the body, making it a little easier to rest on flat surfaces and gives slightly more peace of mind in relation to doing damage to the lens (not that the N8 has had any issues). The phone sits remarkably well in the hand when utilising the hinge driven slide out QWERTY keyboard which makes light work of long emails, texting or general data input, and fully utilises the larger than usual screen. Everything on the shell of the body of the E7 (which although rectangular in shape is nicely curved), sits flush and with a lack of a microSD slot is also minimal. On top of the phone is the media connection centre housing the HDMI, USB and AV adapter plugs. MicroUSB is used for connectivity and charging. Also incorporated into the body is the new switch loaded volume control, the unlock/lock switch as well as home key and camera button all which fit nicely within the whole design theme of the E7. The Sim is not spring loaded but rather slides into a card compartment which allows for hot switching sims cards. Note that the phone will still reset itself if a new sim is inserted without turning it off. Also note that the battery is not accessible to the consumer and would need to be sent to a licensed repairer or contact Nokia if you need it looked at. The home button was conviently located in the centre of the device rather than on a specific side for easier use. My only complaint was the weight of the phone in my pocket. If this was boxing this is a clear heavyweaight contender weighing in at 176g, a 30% increase on most other smartphones. Included in the box was a nice assortment of cords and adapters for all occassions being an HDMI adapter, connectivity cable, stereo earphones and USB adapter. 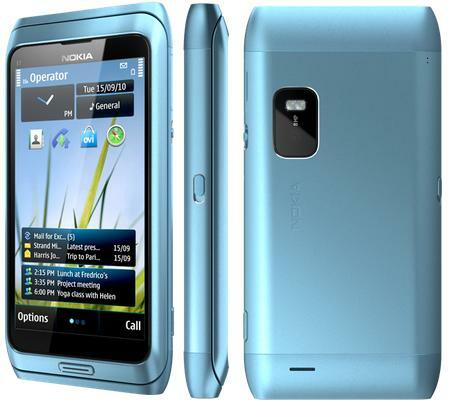 Clear, rich and vibrant is the best way to describe the visual aspect of the Nokia E7. While only being half an inch larger than the IPhone display it is made to look alot bigger by having a very thin and minimal surround. Testament to the 4″ AMOLED display is despite it having a lower resolution of 640 x 320 there is no drop in performance. Apples Iphone offers a 960 x 640 resolution but lacks the AMOLED screen and ClearBlack technology which vastly boost the display abilities of the E7 across its various applications and multimedia options. Nokia have again inplemented Gorilla Glass into the E7 providing an almost indestructible scratch free front panel. I got caught in the rain one day and had to run, resulting in the E7 flying out of my pocket. After watching it slam into the tiles and slide face down a few metres i walked over expecting to have to visit the ATM to pay for it. To my astonishment there was not a scratch on the screen or on any other part of the phone for that matter. Sorry Nokia i do try and look after your products but at least i can say they are tough as hell. Everything from setting the home page to internet browsing was made easier by the larger display which was much more accomodating for a humans fingers than a lot of other models i have used. Watching movies on the E7 was a joy again due to the ample screen size and 16 million colours in nHD 16:9 aspect ratio. Plugging the E7 into a large plasma screen allowed movies of 720p resolution to be seamlessly reproduced with little to no loss in quality. It was somewhat let down graphically while playing certain games but hey i own consoles for that reason not a phone. 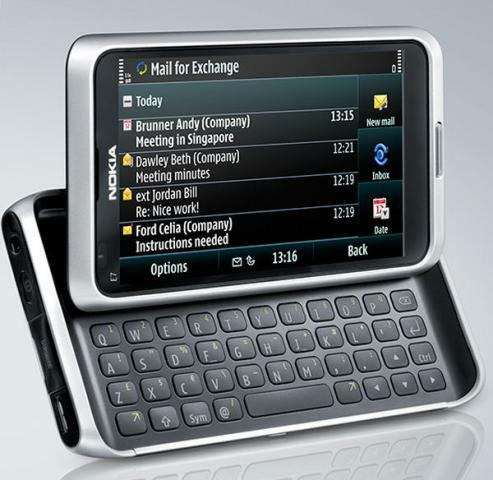 In terms of overall performance the E7 performs as well as any device still using the Symbian3 can. Minor tweaks have slightly improved lag issues but overall some tasks are still frustrating and require redoing. There is just that fraction of a second that can determine the difference between the phone responding to your touch or dropping out. An example is when you are trying to access phone banking and the E7 lags slightly behind when entering account details leaving you waiting for it to catch up to see which digits it picked up upon. Im no technical expert but im assuming a little more sizzle than a 680MHz processor and 256MB RAM would easily fix some of these issues. A dedicated graphics card is also included. Saying that, there was no performance issues whatsoever regarding video playback or lag during recording or any features one would expect due to higher energy use. Included within the E7 is GPS which worked without a hitch in its various real and assisted modes, as well as a 1200mAh battery that lasted a long time during usual use but was drained by video and excessive picture taking. Internal memory is limited to 16Gb with no option to add more via external MicroSD cards, which is enough to hold about 4000 songs or 10000 photos which can be easily transferred between phone and any PC. As with many other models their is an FM transmitter located on the phone just in case you are feeling nostalgic. Im quite a fan of the Nokia homepage setup, from its ease of use to the design and implementation of the various widgets available. While some can argue its a little limited i prefer its simplicity to many other homepages ive come across which give the initial feeling of clutter and mess. Users can choose which applications or features they want displayed on the various homepages allowing it stucture as well as giving a unique appeal. Im useless with dates and times and ive recently put the calendar reminders on the front page complete with alarms and visuals. Calling and messaging on the E7 was simple and provided no problems of note besides the odd instance of lag which had no effect on the quality of voices. The speaker was loud and crisp, not in the same league as the N8 but performed very well in conference calls and for regular hands free use. I might be mistaken but from memory it actually performed better than the N8, providing slightly more realistic tones and voices. Theres nothing overly special about the music player, which features album art to make things a bit easier, but overall is a little retro in feel. The E7 is capable of playing all popular formats inclding MP3, WMA and AAC, and can support bit rates of up to 320kbps with full DRM support. Multimedia on the E7 represents a mixed bag of quality ranging from the terribly frustrating to superbly brilliant. Terribly frustrating is the quality of the the 8MP camera, which due to a lack of an auto-foucs feature produced a high majority of blurry photos. The pictures were very grainy and looked washed out to the point where i actually thought there was a fault in the camera. A big disappointment after the pure pleasure of using the Nokia N8. I apologise for the constant comparisons but i had them both at the same time and aesthetics aside, apart from the camera and weight there was not much feature wise to tell them apart from each other. Where the E7 excels is movie playback and recording. 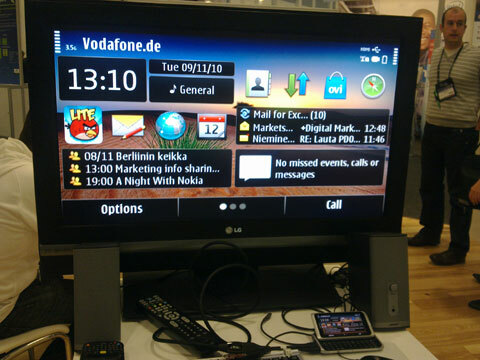 Video playback on a large Plasma screen was worthy of any device capable of playing 720p resolution media. It also supports the .mkv shell allowing to to play such formats as MP4, H.264 and WMV files. The AMOLED display at a whopping 4″ is perfect for conference calls and watching movies when sitting on that boring train ride home. When watching movies through the HDMI output there is also support for full Dolby Digital Plus surround sound for that full cinematic experience. Even quick clips of fast moving objects were presented crisply and the 16 million colour display ensured a vivid vibrant reproduction. While internet browsing was more bearable than some older Symbian models due to the larger screen, the constant waiting times for pages to load made many tasks very tedious. The QWERTY keyboard made things a little easier but still i wouldnt be pulling it out and jumping online unless i didnt have a laptop or something more efficient avaliable. It seems there is a heavy focus on the business features of the phone such as real time email, quickoffice app which allows you to easily view MS Office files, as well as business calls, social networking and a dedicated built in VPN. As already mentioned the camera is quite disappointing and a world apart from the N8. While being 8MP, it doesnt translate on screen which could be a flaw within the focus system that doesnt have an auto setting. All in all this phone could appeal to someone who would get a lot of business use out of it. It would not be the kind of phone i would expect to see the average person using, mostly due to its excessive weight. At at price tag of around $500 it doesnt offer enough against the competition despite many of them being much more expensive. The camera is a real let down while the video component is astonishing, giving the whole phone an inconsistent feel. Symbian 3 does although arguably getting on in years performs well, with a few minor lags and glitches along the way. I did enjoy the simplicity of the home page setup and the large screen was a joy to watch movies and pre-recorded media on. Saying all of that it has a few things going for it that many others dont. It is incredibly durable, the QWERT keyboard makes life a lot easier and the larger screen will prolong your next visit to the optometrist. Personally i preferred some of the other Nokia models but as a business phone the E7 would give few complaints to most users.